As one of the HOTTEST Toys this Holiday Season, Pillow Pets have become beloved friends and companions for both of my kiddo's. B already has Tardy Turtle and the princess has the Patriotic Pup and they go everywhere with them! They sleep with their pillow pets as a pillow every night (they loves the soft fabric; it's sooooo cuddly....they prefer them over the other standard pillows in their bed as they are more comfortable! I wish I could have one too ;). Both B and the princess have been asking add some new friends to the mix.....so the princess was thrilled when Ms. Lady Bug arrived for review (pictured above). As a mom I have to say that I love Pillow Pets for several reasons though my top reasons are that they are washable ( really they come out of the washer just as adorable and cuddly as they are when they go in :) and ours have been washed multiple times now). You can't even really wash standard pillows (they get funky and never feel the same after a trip through the washer- but NOT with Pillow Pets!). I also appreciate the design; the Velcro closure has a comfy tab that covers it securely when its opened up as a pillow to ensure the comfort of your little one! We adore Pillow Pets in our home! 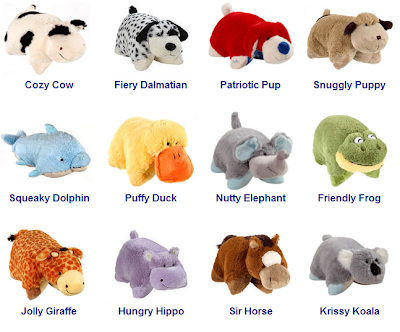 Bring home a cuddly friend for your little one this Holiday Season! 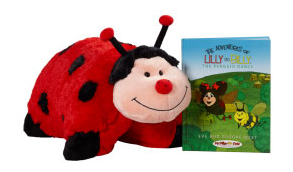 One Lucky reader will receive a Ms.Lady Bug Pillow Pet of their own! 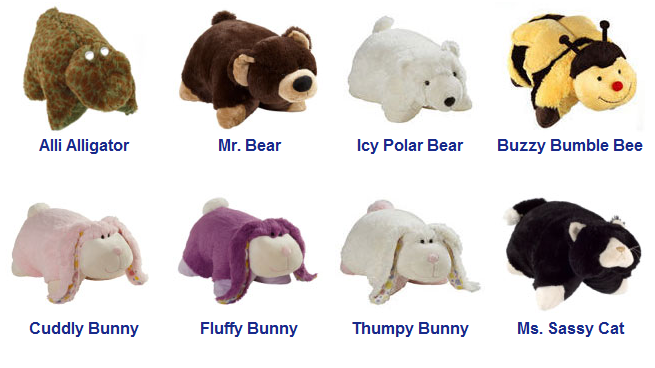 Leave a comment~ Visit http://www.pillowpets.com/ and let me know another My Pillow Pets Item that you would love to give as a gift this Holiday Season! The Comment is considered your entry. Entry to this giveaway ends at 12pm PST December 8, 2010. Winner's are chosen randomly through random.org. The winner will be announced in a post within 7 days of the giveaway ending, and contacted through email. The winner will have 48 hrs. to respond or another winner will be chosen. my son would love the fiery dalmation! I love the Bumble bee! So adorable. I like Pillow pets on FB. My little one would love Snuggly Puppy! I follow My Pillow Pets on TWITTER 1. I follow My Pillow Pets on TWITTER 2. I follow My Pillow Pets on TWITTER 3. I follow My Pillow Pets on TWITTER 4. I follow My Pillow Pets on TWITTER 5. I entered your 4 Moms Cleanwater Infant Tub Giveaway 1. I entered your 4 Moms Cleanwater Infant Tub Giveaway 2. I entered your 4 Moms Cleanwater Infant Tub Giveaway 3. I entered your 4 Moms Cleanwater Infant Tub Giveaway 4. I entered your 4 Moms Cleanwater Infant Tub Giveaway 5. I entered your Belle Baby Carrier Giveaway 1. I entered your Belle Baby Carrier Giveaway 2. I entered your Belle Baby Carrier Giveaway 3. I entered your Belle Baby Carrier Giveaway 4. I entered your Belle Baby Carrier Giveaway 5. I entered your Umi Children's Shoes Giveaway 1. I entered your Umi Children's Shoes Giveaway 2. I entered your Umi Children's Shoes Giveaway 3. I entered your Umi Children's Shoes Giveaway 4. I entered your Umi Children's Shoes Giveaway 5. I entered your Learning Resources Magnetic Learning Calendar Giveaway 1. I entered your Learning Resources Magnetic Learning Calendar Giveaway 2. I entered your Learning Resources Magnetic Learning Calendar Giveaway 3. I entered your Learning Resources Magnetic Learning Calendar Giveaway 4. I entered your Learning Resources Magnetic Learning Calendar Giveaway 5. I entered your Takeya Tea Maker Giveaway 1. I entered your Takeya Tea Maker Giveaway 2. I entered your Takeya Tea Maker Giveaway 3. I entered your Takeya Tea Maker Giveaway 4. I entered your Takeya Tea Maker Giveaway 5. I entered your Red Robin Giveaway 1. I entered your Red Robin Giveaway 2. I entered your Red Robin Giveaway 3. I entered your Red Robin Giveaway 4. I entered your Red Robin Giveaway 5. I entered your aden+anais Classic Sleeping Bag Giveaway 1. I entered your aden+anais Classic Sleeping Bag Giveaway 2. I entered your aden+anais Classic Sleeping Bag Giveaway 3. I entered your aden+anais Classic Sleeping Bag Giveaway 4. I entered your aden+anais Classic Sleeping Bag Giveaway 5. I love the little frog, this would be a great gift for my niece. My daughter would love love love the Turtle! I have the Mommy Approved Button. I have the Holiday Guide Button.